This crazy-satisfying chicken dish is a whole chicken cooker in white wine, olive oil, bacon, onion, leek, crimini or baby bella mushrooms, garlic, beef stock, red pepper flakes, rosemary, and kosher salt. If you have beef bone broth on hand, bonus points for using it! This goulash is deliciously savory with parsnips, onions, carrots, mushrooms, garlic, and plenty of Hungarian sweet paprika. Tomatoes and dry red wine take the flavors to the next level. You can serve this goulash over grain free pasta, potatoes or sweet potatoes, or even just veggies. Looking for a simple and elegant dinner for two? This braised chicken and mushrooms is made with boneless, skinless thighs, yellow onion, garlic, oregano, button mushrooms and beech mushrooms, chicken broth, and a delicious lemon-and-thyme cauliflower. In this dish, the mushrooms cook together to form a velvety cream sauce that’s totally free of dairy. Coconut milk and onion blend to form the most amazing flavor, also creating loads of creaminess. Sea salt, hemp seed, and hot red pepper flakes add texture and flavor. This minced mushroom Bolognese is great for when you’re serving vegan guests, and it has such a fabulous flavor that you won’t miss the meat. It’s made with olive oil, onion, garlic, carrot, chopped mushrooms, tomatoes, red wine vinegar, and fresh basil, and served over a bed of zucchini noodles. 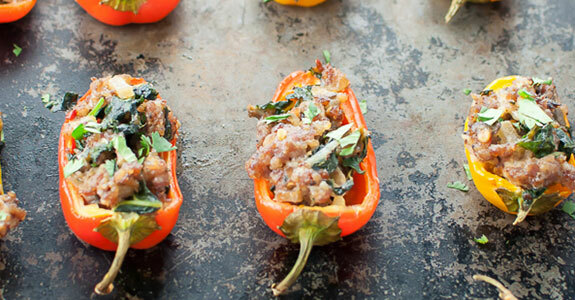 Stuffed with pork sausage, crushed red pepper flakes, minced shallot, mushrooms, and kale, these mini sweet peppers are a delight for family, friends, snacking, and parties. They might even be a way to convince your kids to eat peppers! I love pan-roasted dishes like this one, because you can get them going and then stick them in the oven to let it work its magic while you prepare the rest of the meal, get a head start on kitchen cleanup, or just spend some time with your family. Also, it’s delicious! This soup, made with delicious cauliflower “cream” instead of dairy, is filled with crushed garlic, spinach, mushrooms, nutritional yeast, and seasonings to create a lovely herbal and almost cheesy flavor without any actual cheese. This is one for the books! 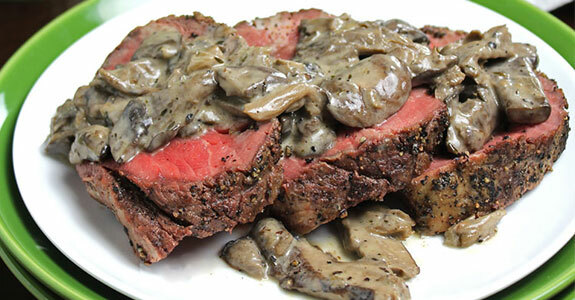 This creamy mushroom sauce is absolutely delicious, so add a peppercorn beef tenderloin and you’re already in heaven with butter, shallots, thyme, beef broth, and coconut milk to replace the heavy cream. 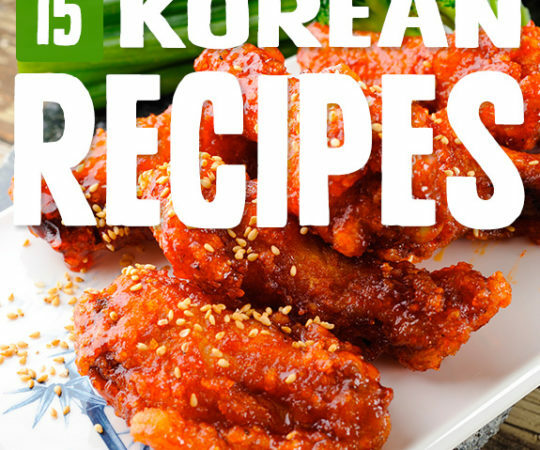 This is an easily adaptable recipe that everyone will love. This delicious rib eye roast (or beef tenderloin, or tri-tip loin) is made with fresh rosemary, giving is a lovely herbal flavor. Butter adds a velvety richness with salt, pepper, garlic, and chicken or beef stock. I recommend using olive or avocado as the cooking oil. In my opinion, this dish is just about the perfect combination of these ingredients for maximum flavor impact and nutritional value. You’ll need butter or olive oil (I vote butter), onion, crimini mushrooms, prosciutto, garlic, fresh thyme, broccoli rabe, and freshly ground black pepper. This skillet is a far cry from the gooey green bean casserole you might be used to eating at Thanksgiving. Instead, it’s made with minced garlic, yellow onion, white mushrooms, veggie broth, chili powder, cumin, paprika, coriander, cayenne pepper, coconut cream, and chopped walnuts. This super-simple recipe would make an excellent easy breakfast with lots of protein and flavor from chopped kale, chestnut mushrooms, oyster mushrooms, lemon juice, sea salt, pepper, olive oil, chili flakes, and fresh Greek basil with a crispy fried egg. 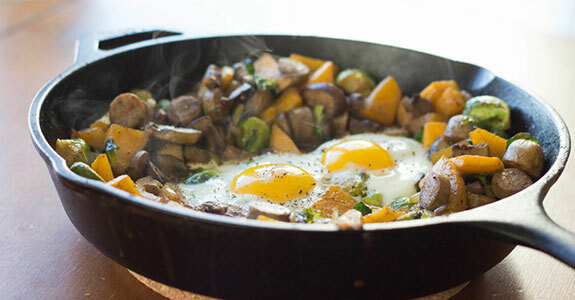 Here’s another breakfast hash idea, with coconut oil, shallots, Brussels sprouts, butternut squash, portabello mushrooms, chicken sausage, eggs, paprika, nutmeg, salt, and pepper. It’s simple and delicious, and takes only a few minutes to whip up. It’s rare to find this unique a recipe, but I love the idea of cooking a thin omelette and using it as a wrap! This one is delicious with sliced button mushrooms, fresh spinach and torn lettuce leaves, and a salad of your choice to eat with the wraps. Simple and healthy! I’m a huge fan of roasted spaghetti squash, and this recipe with butter, mushrooms, onion, and garlic is a perfect way to enjoy it. Fresh torn sage adds a delicious herbal flavor. If cheese is not a part of your diet, feel free to leave it out, but I highly recommend using the truffle oil and toasted pine nuts. Using your slow cooker is a great way to make healthy and hearty meals without much effort or time from you in the kitchen, and this creamy Swiss steak is a perfect way to use it. For the steak you’ll need onion, coconut flour, tapioca starch, and a few other ingredients. 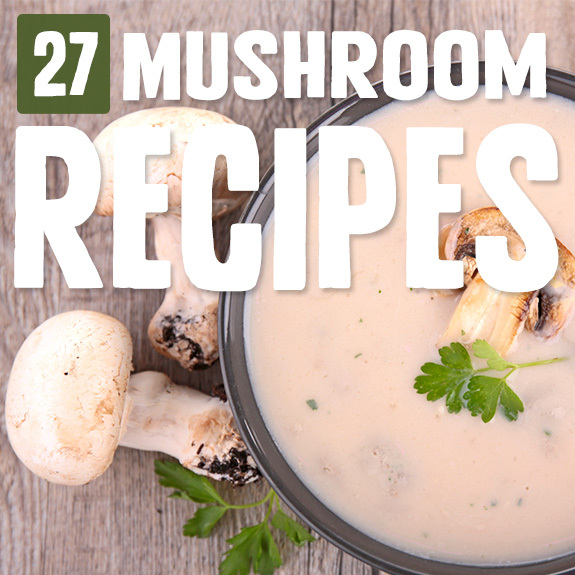 Top it with the silky mushroom sauce! This bacon veggie soup is beautiful and delicious with a mix of flavors, colors, textures, and ingredient types. 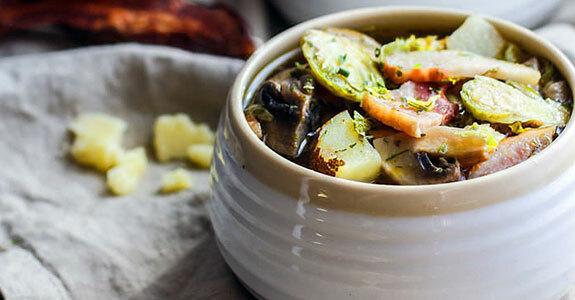 You’ll use broth, chopped potato (or sweet potato), Brussels sprout shavings, sliced mushrooms, smoked bacon, honey mustard, paprika, garlic, sea salt, black pepper, and herbs. While this soup may boast a delicious beef brisket, the broth itself gets all of its flavor from dried shiitake mushrooms, carrots, leek, mushroom powder seasoning, star anise, ginger, coriander, black cardamom, cinnamon, and other unique flavors. This beef stroganoff is made simple with beef, sliced mushrooms, Worcestershire sauce or coconut aminos, lemon juice, onion, and some coconut yogurt (to replace the sour cream or Greek yogurt). You could also use coconut cream or cashew cream! Here’s an easy dish that’s great for busy weeknights, when everyone will think you spent hours at the stove! It’s ready in just 40 minutes. You’ll need chicken breasts, bacon, red onion, mushrooms, olive oil, bell peppers, tomato, white wine, garlic, dry thyme and oregano, salt and pepper, and fresh basil. 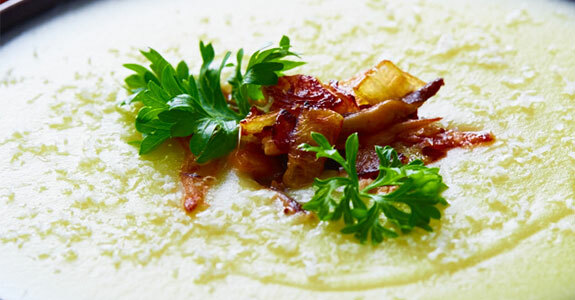 This potato soup is comforting and warm—great for a sick day or a chilly evening! You can make it with leeks, onions, garlic, potatoes, chicken broth, parsley, and oyster mushrooms. Feel free to leave out the parmesan or replace it with nutritional yeast. Here’s a juicy dish that’s bursting with flavor from pork tenderlon, rosemary, figs, apple, and mushroom. The carrots and onions round out this dish to be a great source of both protein and veggies as well as healthy fats. And don’t forget the flavor! Just say butter and garlic, and I’m in. Add balsamic vinegar, basil, and oregano? Now you’ve really got me excited! I love that this dish is so easy to bake in the oven while you’re cooking the rest of dinner. 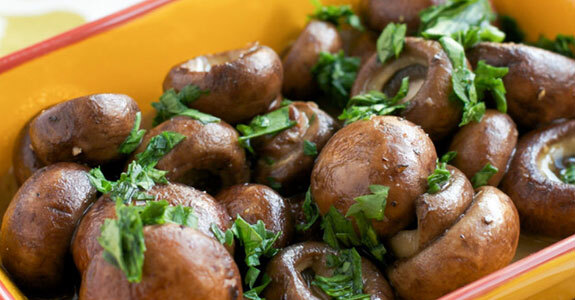 These mushrooms make a great simple side dish. For a deep roasty flavor with fresh thyme and garlic, try this recipe for roasted mushrooms. They’re roasted in olive oil instead of butter, imparting an extra sophisticated flavor that would go well with just about any entrée pairing you could think of. 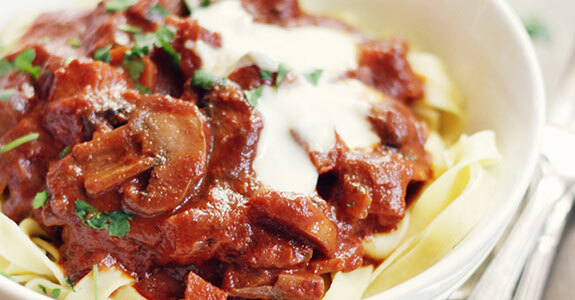 Mushrooms are just amazing with garlic, so get used to seeing plenty of recipes using both! This one, though, adds dry white wine, sherry, and fresh parsley for a elegant side dish that is sure to impress your guests as well as your family. Just because you don’t eat real rice anymore doesn’t mean you can’t still enjoy rice pilaf. This version is made with cauliflower, onion, garlic, button mushrooms, cardamom pods, coriander, coconut oil, cinnamon, turmeric, cumin, and more.